« Too little, too late? Published on March 27, 2018 in General T&T, Oil and Gas, Politics, THA and Tobago. 9 Comments Tags: Stephen Kangal, T&T Govt. Current proposals that are now in the public domain by way of the Bill No 5 0f 2018 geared to accord a higher level of self -governance to Tobagonians will create another façade Legislature like that of its predecessor exercising political and administrative autonomy merely to achieve peace, order and good governance. Tobago must be treated with dignity and their ownership or sovereign rights over adjacent maritime resources (living and non-living) to be exploited for the welfare of its people must be recognized and legitimized. This is the age of Nationalism. Tobago must accordingly be granted an adequate measure of maritime resource jurisdiction and effective and shared control over its rich maritime patrimony to be exploited as Tobagonians see fit to increase their self-reliance, economic independence and incrementally reduce their traditional dependency syndrome on Trinidad. 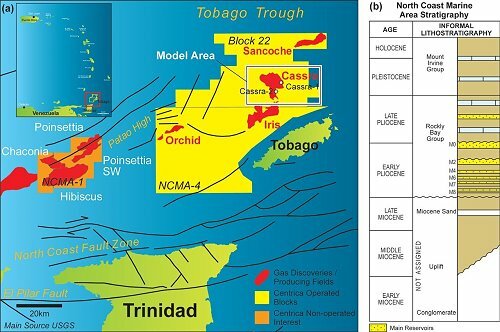 These hydrocarbons deposits lie on the natural physical prolongation of Tobago (its geological and geomorphological continental shelf) into and under the sea. That is the legal basis for claims to the resources of the sea beginning in 1942 and 1945 on the basis of the Gulf of Paria Treaty and the Truman Proclamation and followed universally. They are nearer to Tobago and installations are clearly visible from shore. The Bill to endow the new Tobago Legislature and Executive Council to extend its law-creating capacity exclusively to the island of Tobago and its dependencies and eleven miles of Archipelagic Waters falls short of what is just and equitable and politically correct Rowley or no Rowley in charge now. That is a deprivation of the physical natural endowment bequeathed to Tobago by Nature for the benefit of those who dwell therein and to secure its economic well-being as an island developing entity exercising unitary statehood with Trinidad. The strategic location and value of Tobago as the raison d’etre for the 1986 declaration of the archipelagic state of T&T cannot be over-emphasised. The entire boundary between T&T and Barbados on the one-hand and with Grenada is measured from and derived from Little Tobago. 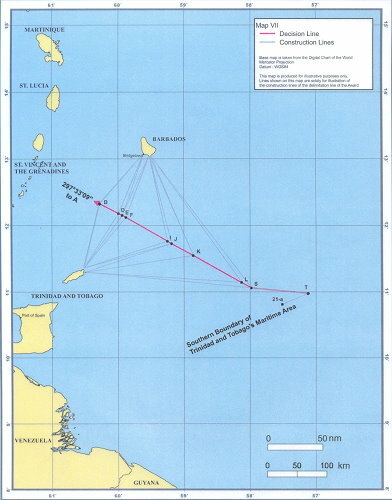 (See Map below) It stands to reason that Tobagonians must now be accorded a type of functional exclusive economic jurisdiction over the living and non-living resources of a sizeable part of the adjoining Exclusive Economic Zone located seawards of the limits of the 12-mile Territorial Sea over and beyond what is being proposed using as a determining factor the critical factor of adjacency. 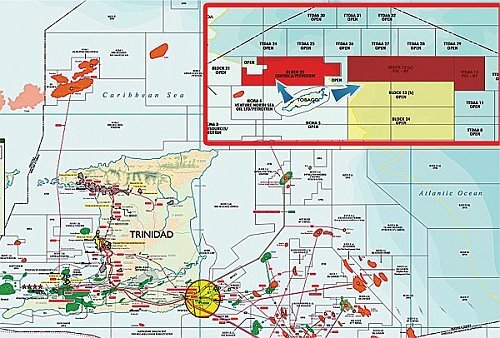 Tobagonians cannot be encircled as they are in fact encircled by maritime oil/gas blocks on all sides and yet are blocked by an imperialistic statute from exploiting and deriving direct benefits from these oil and gas fields. This is a denial of their solemn and inalienable maritime patrimony to be harvested equitably for the benefits of its people that is the essence and foundation of the new public order for the oceans of 1986. Accordingly the proposed Tobago Legislature, House of Assembly and Executive Council should be invested in the Bill with the law-creating capacity to apply and extend to the main island, the off-shore islands, the archipelagic waters, parts of the territorial sea of 12 miles, their superjacent air-spaces and the exclusive economic zone located North, East and West of Tobago. That would constitute real empowerment of the people of Tobago. That is the real test of meaningful internal self-governance of Tobago and the strategic road-map to achieving self-reliance and true economic independence of Tobago that is the equal counterpart of Trinidad as the Bill recognizes. If not Tobago remains and continues to be a glorified ward of dependence and injustice. “Tobago shall comprise the island of Tobago, Little Tobago, St. Giles Island, Marble Is, Goat Island, Sisters Island and other off-shore islands, the archipelagic waters and parts of the Territorial Sea, the air-space above these two aforementioned maritime areas as well as over the land-space and shall exercise sovereign and other rights over parts the adjacent Exclusive Economic Zone on behalf of Trinidad and Tobago as set out in the Archipelagic Waters and Exclusive Economic Zone, Act No 24 of 1986. They sucked up when times were great for them. This is Crusoe island where the white capitalized over the years but now only rain is falling on them. Leave the HNs and the few whites there to their fight. Let them kill off each other like the many gangs here that “dem boys” (PNM/UNC) are afraid to arrest. I know why…cause they want desperately a “police state” to reign here as they become the “bona fide” dictators…ask the 1%….another Syria here? God doh sleep. Remember Ghadaffi was dragged through the streets of Libya until he was dead. The British and the NATO allies were busy bombing out his records on them. but those truths are being seen in BREXIT and the fall out from that as with Putin who now reigns. Accept the returns you produced. Thats what God tells all of us who are equal before him ( no pull string or networking as in North America rests with God …nothing like that gets you into heaven) . You must atone for your sins as Trump now knows or they follow you until you are dead. You knew what you had to do about your bad leanings over the years did you not?. We come here on earth with genes you do not get to choose. Nevertheless the free will we come here with helps us to choose between “self” or the principles of Jesus Christ made man and/or the Virgin Mary as our example who is the only pure human being worldwide throughout all time. The sick PNM/UNC polices over the years have now come to fruition. The devil now reigns now here …BIG TIME. Tobagoians came here to Trinidad…some still in Trinidad like deceased PM Robbery and thay all milked the system (played us all) for years ….they were never interested in Separation.from Trinidad for they wanted the returns from the oil and gas systems ..they were all talkers and they played us like the “Raging Bull” now playing all ah we ….He (Rowdy…I want to meet you on the pavement like a thug became the first PNM/UNC ..HDC billionaire. Ask Karl …he rented from him. Where did he and the other short white man in the Finance Ministry made all their monies …they still playing all ah we. You leave that fight alone. One suit the other ….House Niggers (HNs)they all are alike. My father was one of the local house builders keeping the price of home free to us to have ( for instance in Stuart Road , Westmoorings North house and land in the late 70s were $15000 ). Francis Prevatt (HN) carried that price tag in one year to over $100,000. Oil and gas money in the first AND ONLY oil boom we benefited from was the trigger whilst they kept land development to a minimum. My dad the only one man builder of a 10 Townhouses as in La Estancia, Diego Martin…. for his $1million dollar over draft loan was signed off with Ron Harford and Mr Ho Hing getting three townhouses at cost as part of the deal. They sat on their arses and made millions. One of those Townhouses sold for 2.2 million TT two years ago. On the building of La Estancia Town homes I believe my dad suffered immensely mentally and health wise in the 80s and this was after that ordeal where NHA was changed to HDC and became a huge money spinner for Government Ministers and their friends. And the entire housing industry in Trinidad and Tobago became all screwed up. Middle Class Citizens of T&T could no longer afford a suitable house working combined for $20,000 per month or lower. Dad used to talk as the overdaft for them virtually became non existent. Instead persons like the Syrians became builders. The housing industry is now run by above the law bandits. Land and House records are in a mess and totally corrupted. The PNM Goverment now want enforced property tax without rent controls like in Canada. They still know little but they now have all the money (the 1%) and they are playing all ah we….never liked the HNs and the French Creoles …last being Colfire and dem. They broke Mr Duprey and his boys as they were not white like Bull Moose and them. However God always has the last say May he continue to bless T&T. The above posted comment is totally unrelated to the article and is a huge digression that ought to be expunged to avoid going from the sublime to the ridiculous. Please ! It is good to see that when Stephen Kangal puts his mind to objectivity he can present present a good article. He is on target as to what should constitute ‘local jurisdiction of Tobago affairs’ by the Tobagonian people. Tobago should never have been treated as a ‘ward’. It’s history, geography, culture and maritime location should be considered unique and separate from that of Trinidad. Its defense, foreign, diplomatic and political liaison with Trinidad should however remain intact. While Tobago was a ward of Trinidad for administrative arrangements that ward-ship came to an end on 9 December 1996 when the Act No 40 of 1996 repealed and replaced the Tobago House of Assembly Act, Chap.25:03 to provide for the membership, powers and functions of the Tobago House of Assembly and its Executive Council and other matters giving Tobago exclusive jurisdiction over 39 matters in accordance with Schedule Five that outlined its areas of responsibility. There was no need to mention the issue of ward-ship in the Bill that is before a JSC until 31 July 2018. That matter was settled 24 years ago. What concerns me is that quantitative land-based government of Tobago is being used a a facade and substitute for real qualitative maritime inclusive self-governance- deliberate vertical governance as opposed to real horizontal governance that extends to the maritime patrimony of Tobago that can be its principal source of revenue and prescription for true economic independence while retaining its political links with mainland Trinidad. There are no problems with T&T’s retention of responsibility over Sixth Schedule matters. The crux of the legislation is the restrictive reach of eleven miles from the low water-mark that cossets and reigns in Tobago’s internally generated governance without its maritime patrimony to be included.That is the bone of huge contention that must be resolved and reconciled with the just self -government aspirations of the people of Tobago. You are typical ar******. Tobagonians do not deserve anything of value as they simply do not have the nerve to want to see what is required to self develop. You must have bring out your axe to grind. Please confine yourself to Caroni and develop issues there especially the continued flooding woos that drains our treasury. Yeah what BS you are pushing;anyway members of your race are typical exploit anything that can produce a dollar(s) in your hands having no morals, standards or godliness. A good theoretical proposition for Tobago, but the reality is that the THA, past and present, has not demonstrated that it has the ability to manage its own affairs without the “supervision” of its Trinidad PNM cult leaders, who are also challenged when it comes to managing Trinidad. Economic necessity is the mother of invention and innovation and I pray that in the face of such promise in Tobago leaders will step up to the plate and provide the level of leadership that is necessary to take Tobago to the next level of economic self-sufficiency and creative governance without waiting on handouts dispensed from The Ministry of Finance. Just imagine the low level to which Cudjoe and Webster Roy usually descend and we would realise the enormous ground that has to be covered in Tobago that is waiting for hands and minds to unlock the vast potential both inland and off-shore. Tobagonians must reject yes men with jacket and tie in the THA and People’s House looking good but nothing substantial to put in the table to make a difference to the Tobagonian economy. However I am a born optimist that the enervating climate can produce the goods. I can feel the maritime energy whenever I am there. A new breed will emerge soon T Man.